When ‘Paranoid’ came out in 1970, legendary Birmingham group Black Sabbath imposed a (short-lived) ban on releasing singles. It was to be, as far as they were concerned, their first and last single. The single has a tendency to be chirpy, snappy, a bit disposable. It stands in contrast to the group’s ethos, their doomy, expansive creative vision and cohesive, drawn out albums. The success of ‘Paranoid’, they claim, brought them some unwanted types among their audience. Eventually, though, they were won over. That they’re now releasing a box set of 7 inches is testament to the enduring appeal of these songs. Out now, ‘Supersonic Years – The Seventies Singles Box Set’ holds tracks like ‘Paranoid’ and ‘Iron Man’ along with later efforts like ‘Am I Going Insane’ and ‘Hard Road’, all remastered by Andy Pearce. With rare sleeves and a comprehensive book of liner notes, it’s one for the Sabbath fiends but also for anyone looking to understand just how the ‘Godfathers of Heavy Metal’ made considerable headway in the charts throughout that decade. 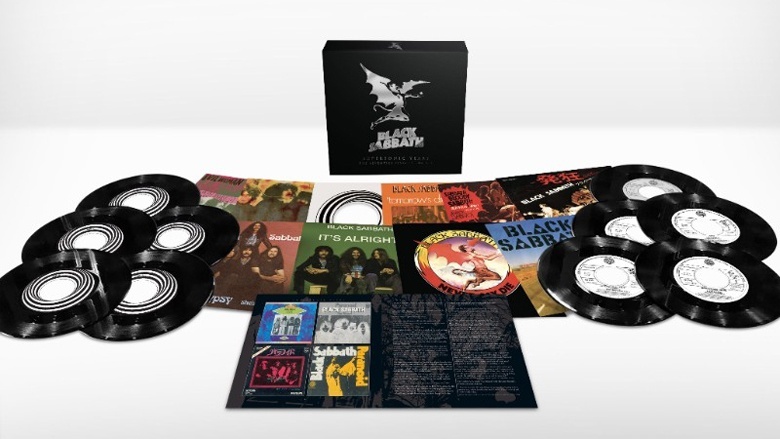 For a chance to win a copy of this box set simply name your favourite Black Sabbath single - we'll pick the winner!